I had a couple of days' break from opening my computer because I was feeling a bit down and needed to focus on offline life more. 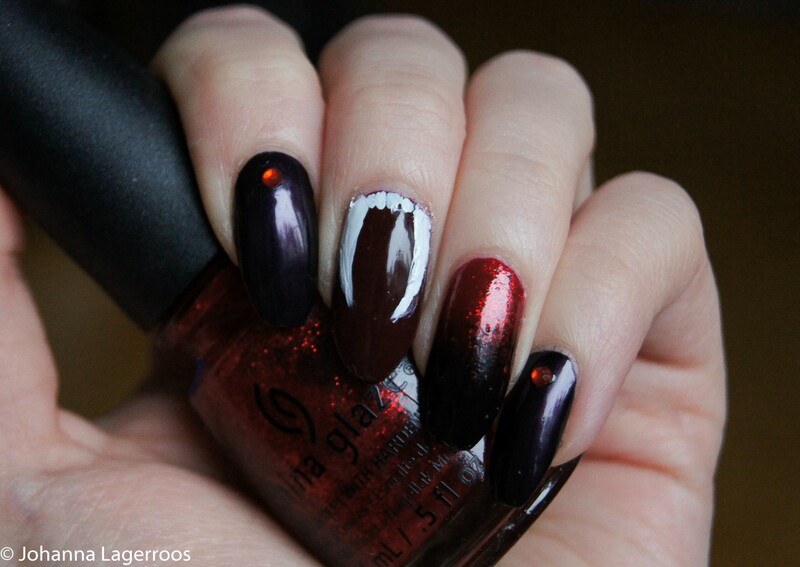 Today I'm finally bringing a new nail art post, and hopefully tomorrow another costume post if possible. But let's focus on the nails now, right? 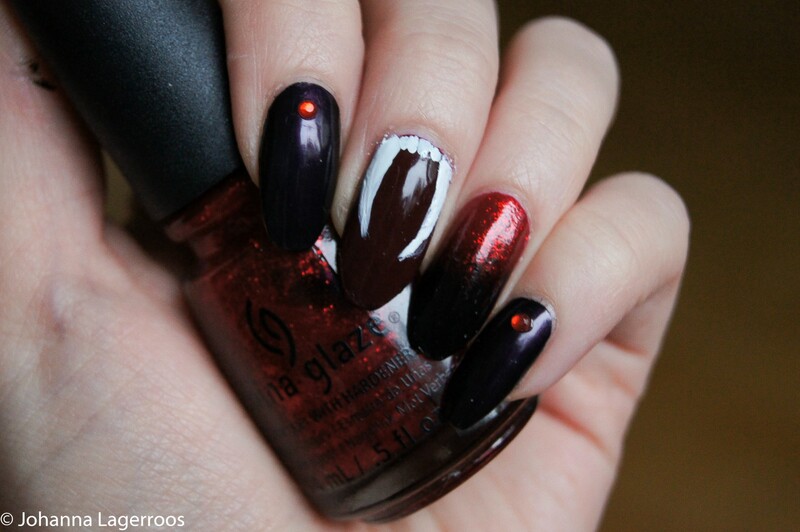 This nail art piece was inspired by vampires, like the title tells you. I've done something similar before and you can find it along with all the other past Halloween posts by clicking the tag "Halloween" at the end of this post. Again, I wanted to keep things quite simple with this design because like mentioned in some other post, this year I want to do designs that basically anyone can do with not that much practice. I personally really liked the black and red color scheme with a hint of purple elements. I feel like it suits the vampire theme well, and is also quite stylish at the same time. Also I liked the added little glam from the rhinestones. 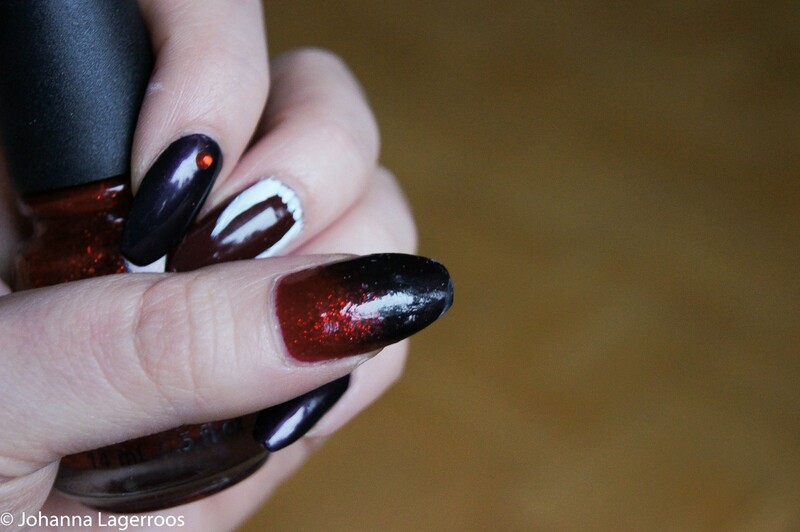 For the glitter gradient nails, I painted the whole nail with the red glitter polish, and then swiped that and black polish half and half on to a sponge, and patted on the gradient. To make the cleanup easier, I used liquid latex so I could peel off any unwanted polish on the cuticles. These nails could be made more extra by for example adding a lace stamp or doing a dripping glitter blood nails instead of gradients. Get creative with your own designs and do anything you want to. And speaking of glitter drips, I may do just that for one of the posts. It's much easier than many people think! 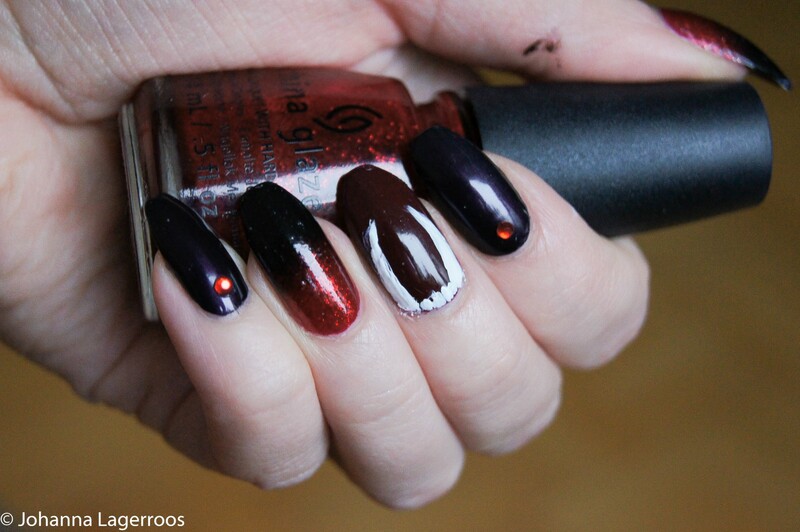 The polishes I used for this design are all by China Glaze. The shades are called Liquid Leather (black), Ruby Slippers (red glitter), White Out (white), Wine Down For What? (burgundy) and Glamcore (dark shimmery purple). The rhinestones are from Born Pretty Store. 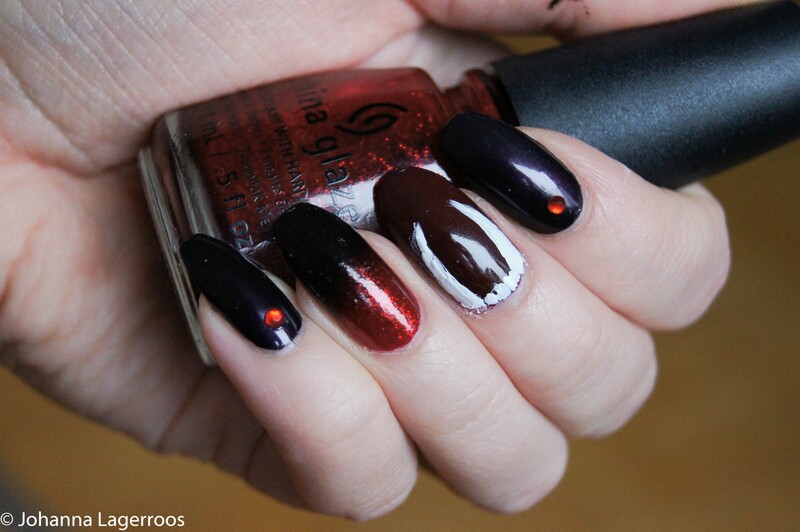 What do you think about this nail art? Let me know in the comments! I hope you enjoyed this quite quick nail art post today, and like mentioned above, I really try to get the next costume up tomorrow. Unless I get too caught up with Pokemon Go and Halloween update. Yes, I still play it and no I'm not sorry about it at all. I'll see you on my next post!